Ad astra per aspera. To the stars through challenge. In 1966, a dedicated group of Orlando community leaders led by the late Reverend Canon A. Rees Hay wanted to provide a top-quality, independent secondary education for students in Central Florida. They established Trinity Preparatory School, where classes began in 1968 for 173 students in grades seven through 12. We have grown to include grades six through 12 with 862 students this year. Trinity Preparatory School has never compromised its commitment to a rigorous curriculum, a highly qualified and caring faculty, a low student-teacher ratio, a strong athletic program, an outstanding fine arts program, and an exceptional college guidance program. We are honored as the only Malone School in Florida, one of 50 exceptional independent schools in the country. The Malone Scholar program provides access to need-based scholarships for students and the Malone Schools Online Network (MSON), where we offer even more advanced courses with other Malone Schools throughout the country. We're accredited by the Florida Council of Independent Schools (FCIS) and a member of the National Association of Independent Schools (NAIS) and the National Association of Episcopal Schools (NAES). Ad astra per aspera, ever our song. Believing that the Rich Library entry should have a focal point, Canon Hay purchased a cast plaster elephant. For many years it has been part of the commencement procession. One graduate each year is selected to decorate and process to the stage with the elephant during the commencement ceremony. The Trinity Prep processional banner was designed by Winter Park artist Betty Wolfe in tribute to our school and is used during chapel, baccalaureate, and commencement. With the help of Trinity Prep parents, Martha Ellis (wife of Trinity Prep’s second headmaster, Reverend H. Benton Ellis) created the banner that hangs behind the podium on the stage of the Education Center during these events. Each year the whole school gathers to honor the founder of the school, Canon A. Rees Hay. This often includes a visiting former member of the Trinity family who speaks about the history of the school in an all school assembly. After the first victory of Trinity Prep’s Saints football team in 1970, Canon Hay declared a school holiday. This day has since become a much-anticipated “surprise” day held in the spring. 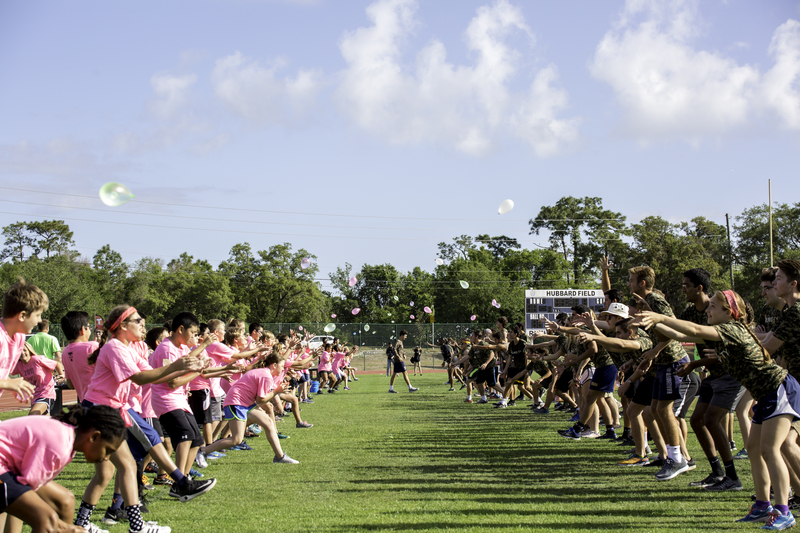 Classes compete in events like crab soccer, ultimate frisbee, balloon toss, and a pie-eating contest. The morning ends with the annual junior-senior rope pull over the canal between Lake Martha and Lake Burkett. School is then dismissed for the rest of the day to allow the students and faculty to relax at an otherwise busy time of the year. Senior traditions include Senior Investiture, gathering at Senior Rock and other senior privileges. At the beginning of the school year, Senior Investiture is held to acknowledge each member of the senior class. The seniors then assume leadership of the student body for the upcoming year. When it is time for commencement at the end of the year, the seniors paint Senior Rock and instead of being given their diplomas in a traditional fashion, they will gather around the rock and pass the diplomas around in a circle until each senior class member receives his/her diploma. This ritual symbolizes starting out as one unit, but then continuing on in the world on their own, always surrounded by the Trinity family. In addition to their leadership role on campus, seniors are also allowed use of their own hallway, priority seating at assemblies, open campus, and special exam exemptions. Spirit week is part of the homecoming activities that take place each fall. A pep rally, homecoming parade, alumni BBQ, and the Athletic Hall of Fame ceremony are held in conjunction with the homecoming game and crowning of the homecoming king and queen. Traditional events that are part of the year-end activities include a yearbook assembly, awards assemblies, senior luncheon, and baccalaureate.